Susan DeMay was raised on a farm in Palmyra, New York and went to Clifton Springs High School where she was awarded “Student Most Likely to Succeed in the Field of Art.” In her college years she went to a number of art programs in different colleges. She was in the last graduating class before the merger between George Peabody College for Teachers and Vanderbilt University. 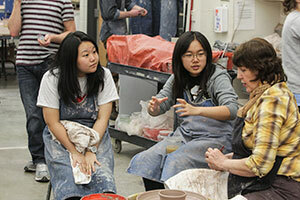 She was subsequently brought on to the faculty of the Art and Art History Department to teach ceramics part time. for nearly two years. A short break allowed for nearly a year in Europe on a Belgium Cultural Exchange Grant; and then for studies at the Appalachian Center for Craft in Smithville, Tennessee, and to finally establish her own studio there. Susan returned to Vanderbilt in 1985 and settled into a dual career as a professor and studio artist. Her ceramics studio produced several production lines, most famously sold at the Smithsonian Museum Stores. Susan continued to experiment with wall works and sculptural works. In 2003 she shifted the balance of her work to fulltime teaching and scaled down her studio operations. 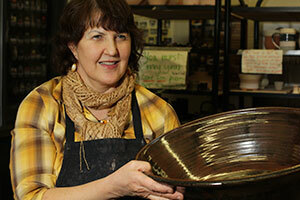 She has kept active professionally by presenting and demonstrating at the National Conference of Ceramics Educators. She has written numerous articles that have appeared in national and international publications and books. Her work has been included in five Lark Book Series and books for beginners studying clay. The latest book was The Best of 500 Ceramics: Celebrating a Decade in Clay. "Sixty-four prominent contemporary ceramic artists served as jurors for this special edition, each selecting what he or she found to be the most technically masterful, stylistically inventive, and historically important pieces featured in the ceramics books of the Lark’s 500 Series." Susan conducts numerous glazing workshops in the region and participates in many exhibitions around the Southeast. Her work can be found in public and private collections.